Like the Packers Falls Bridge, the LRAC seeks to connect people to the river. Students in Raymond are fortunate to have a school located right on the Lamprey River and accesible to several different natural habitats. Teachers have been sharing these resources with students for many years, but the experiences and opportunities were enhanced significantly in 2016. A tired, old shed by the river was torn down and replaced with a beautiful new gazebo. 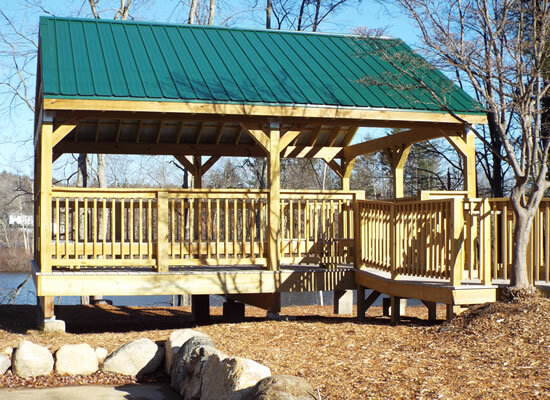 The gazebo has tables for outside lessons during school and picnics in the summer. It will also serve the town during its annual Lamprey River Triathlon that includes a paddling component, as well as running and cycling races. The eco-center is open to the public on weekends and during school vacations. For safety reasons, visitors to the park are not allowed when school is in session.